This shop has been compensated by Collective Bias, Inc. and its advertiser. All opinions are mine alone. 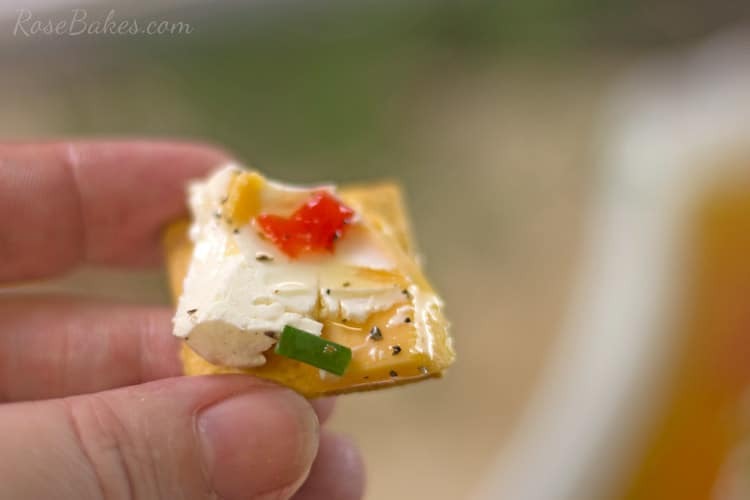 This Marinated Cheese Appetizer is easy, festive, can be made ahead and is perfect party food for Christmas! 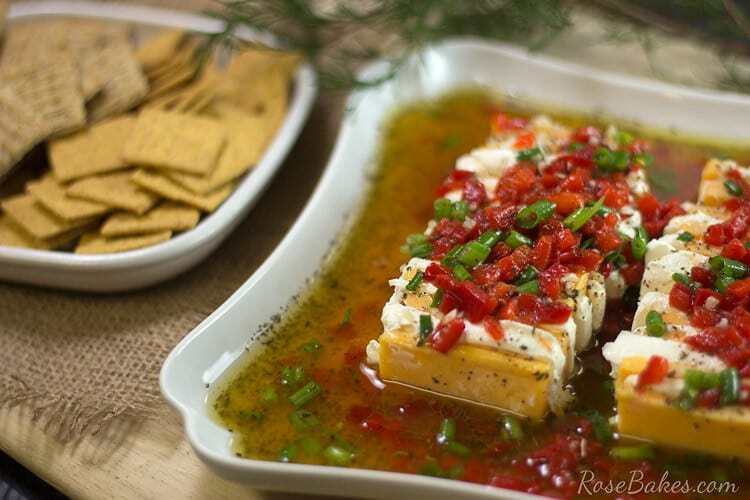 #NaturallyCheesy #CollectiveBias See more amazing recipes using Kraft products here. 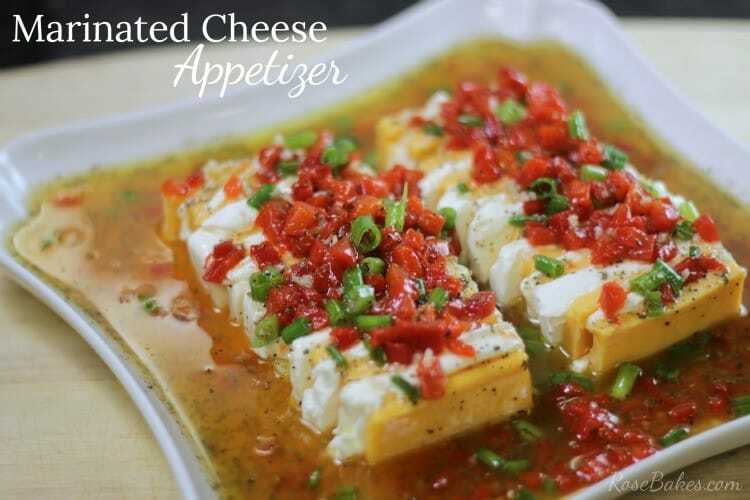 Today I thought I’d take break from all the Christmas sweets and share with you one of my most favorite appetizer recipes. 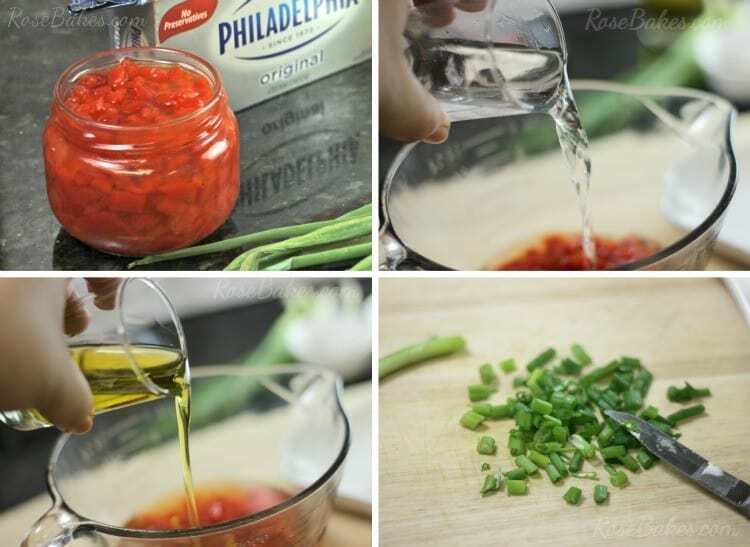 It’s great any time of year, but I really love to make it around Christmas because it’s so festive with the red pimentos & green onions on top! 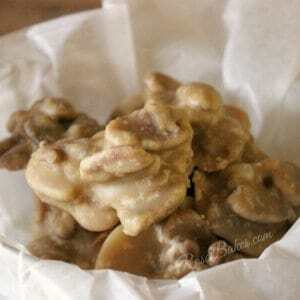 This is a recipe that I fell in love with from the first time I tried it! One of my dearest friends from college, Ginnie, gave it to me back in our college days and I’ve used it over and over again since then. 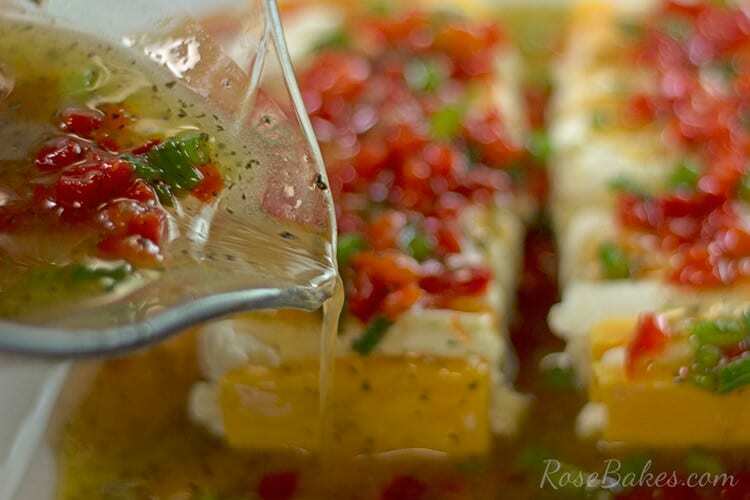 Other than the fact that I just love cheese (in every form imaginable), I love this recipe because it’s tangy and bright – and it’s made at least a day ahead of time so no worries about last minute preparations if you’re making it for a party! Okie-dokie… now it’s time to put this appetizer together. Grab your cutting board, a pretty platter, and begin slicing up the cheeses. 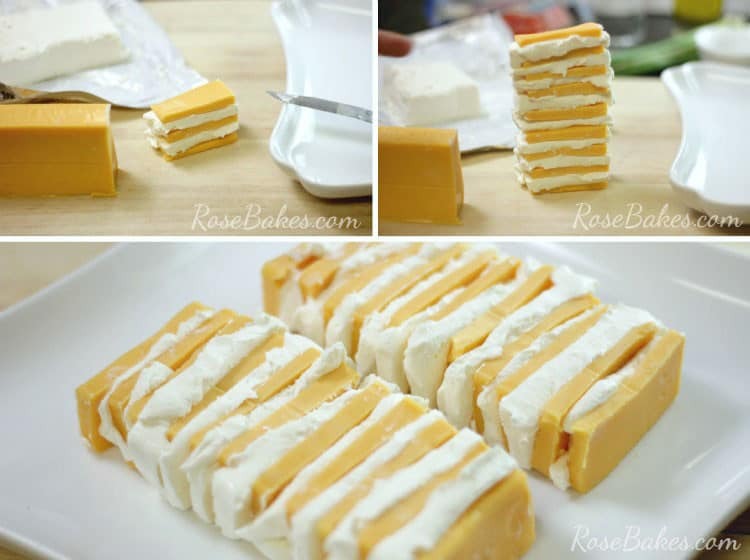 To make the “logs” of cheese, you’ll want to cut slices of each kind of cheese, then stack them alternating. I cut the slices a little less than 1/4″ thick and I like to stand them up when I’m stacking; it’s just easier to stack them than way than trying to line them up lying flat. When you get it as long (tall) as you want (or it won’t stand up anymore 😉 ), lay the whole stack over on your platter. I used a square platter, and did 2 strips of cheeses. You could also use one long and narrow platter! 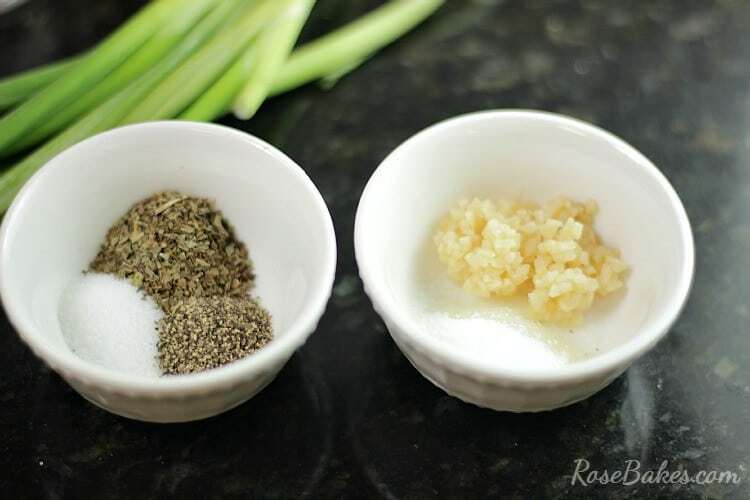 Now you need to make up the marinade! 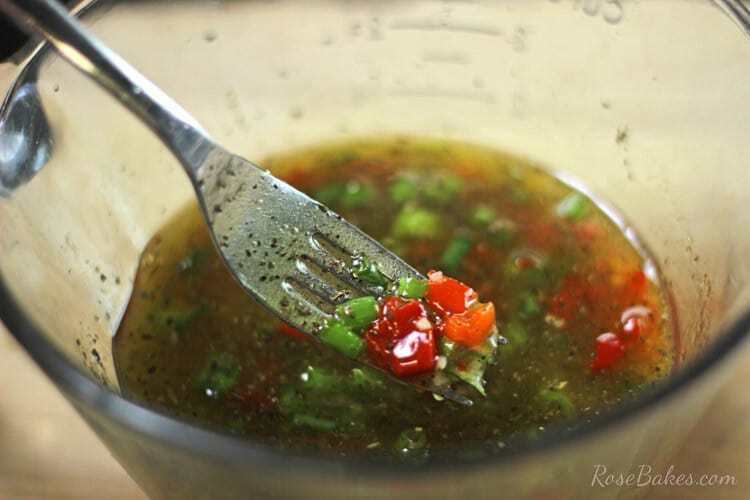 Grab a small bowl or I used a large glass measuring cup and begin adding in all of the remaining ingredients. First I poured in the pimentos (juice and all! ), the olive oil, and the white vinegar. I also went ahead and chopped up the green onions. 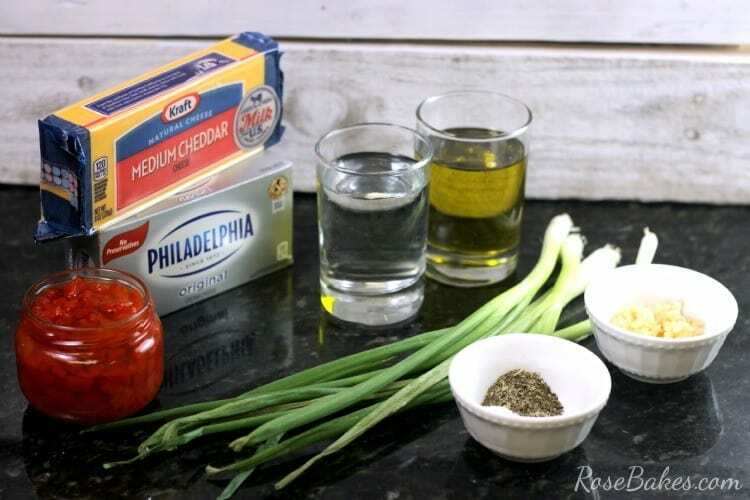 And that’s it – the Marinated Cheese is done! Well… except for the marinating. 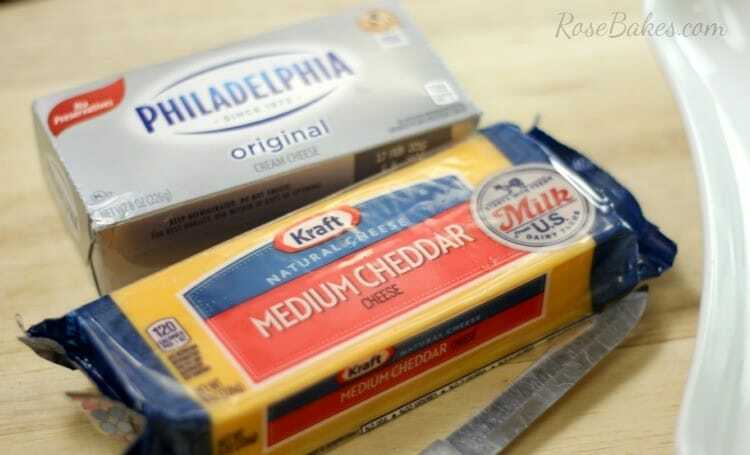 Cover it tight with plastic wrap and stick it in the frig overnight to let the marinate really soak into the cheese. When you’re ready to serve it, remove the plastic wrap and set out a variety of crackers! 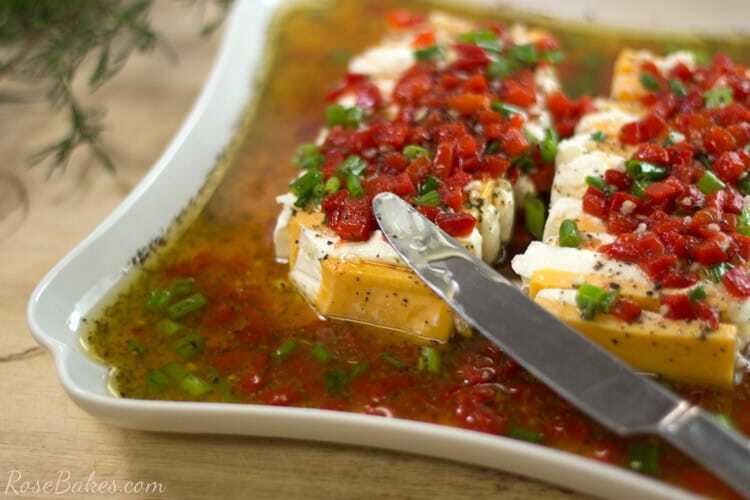 I daresay, this Marinated Cheese Appetizer will gobbled up faster than you can say “Christmas”! Enjoy! 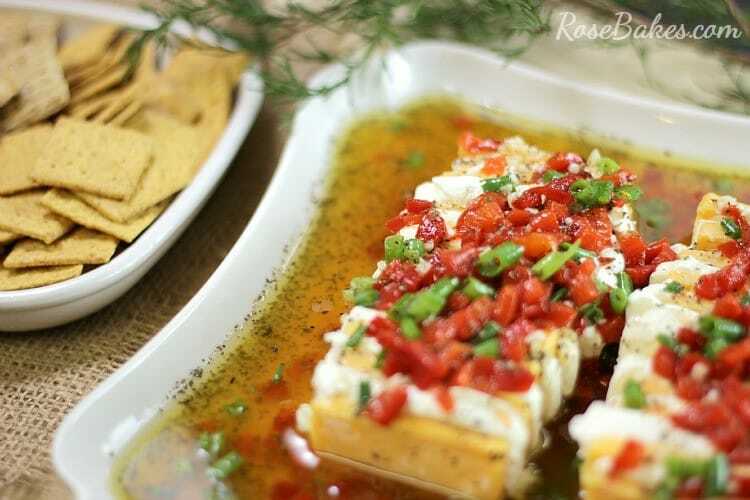 Tell me, tell me – what’s your favorite cheesy appetizer? 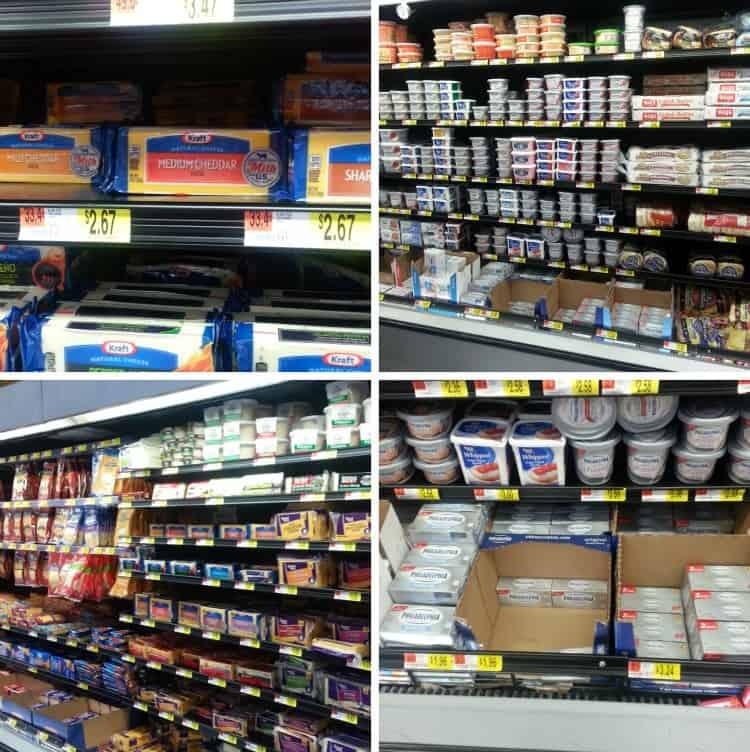 Also be sure to visit Kraft for more delicious recipes including Kraft products! 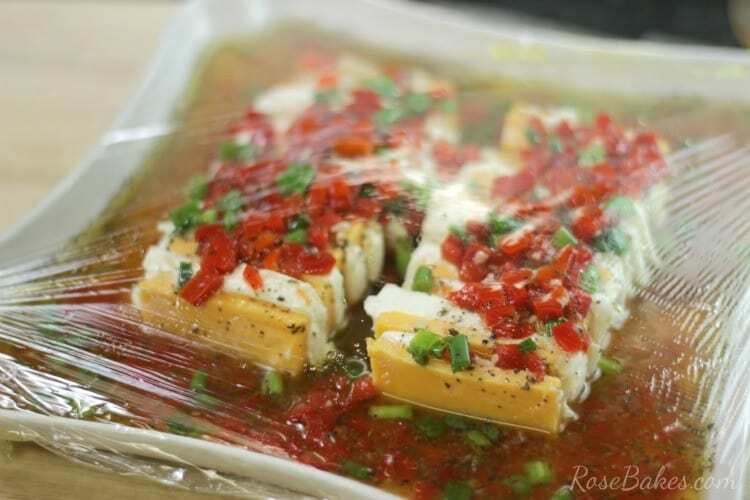 Marinated Cheese : Perfect Party Food! 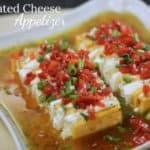 This Marinated Cheese Appetizer is easy, festive, can be made ahead and is perfect party food for Christmas! This looks so tasty and festive too! Pinning! This looks fabulous! What a great app! Thanks for linking up to Merry Monday! Pinned & Sharing on FB! Have a great week! 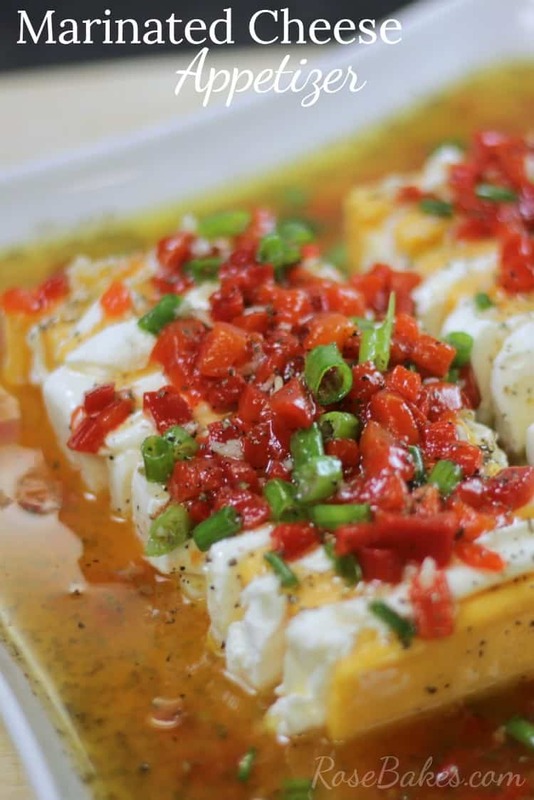 This is a great appetizer idea! Thanks for linking up with What’s Cookin’ Wednesday! Yowza this sure does look like something I’d eat way too much of! Thanks for sharing it w/ us at The Wednesday Roundup – it’s being featured this week! Congrats! Thanks for the feature Cheryl!